The certified nursing assistant jobs are very popular and there are chances of certified individuals who haven’t worked for a long time or their license expires as per the terms of the state. In such cases, they apply to renew CNA certification license and the terms and conditions of renewal of your CNA License may differ from one state to the other. Some states require employment after getting certified at least for 2 years whereas others do not have any such hard and fast rules. Successful completion of the CNA certification program helps one get certified and listed in the registry of the particular state. The license has a particular expiry period and it needs to be renewal after the date of expiry. In order to renew your certification, you may have to approach the registry of your state and fill up a Nurse Aide Registry Renewal Form. The requirements that qualify you to renew your certification vary from one state to the other and you have to be careful to know everything about renewal before applying. In order to renew CNA certification, you will have to get the renewal form from the registry of your particular state. After acquiring the form, you will have to fill up all the details on the form and the details may include your personal details and the ones to be filled by your employer. The form has a separate section which has to be filled by your current employer or the employer who had employed in the last two years. The time period, however, may change according to the state’s rules and regulations. You will have to sign and mention the date at last after your employer or ex-employer fills up the information. After completing the form, you should double check the information filled before mailing the form to the address of the registry of your respective state. The next step is to keep track of your application status and a specific time period is needed to allow the process to be completed, you may have to wait for minimum two weeks and this time period differs from one state to the other. Some states provide you with the facility to check the status of your renewal application online and you may be provided with a certain number with which you will have to check on the given website. You may have to attend a refresher CNA course and appear for the exam again if required by the particular state registry. There are many schools and colleges which offer CNA refresher course that will extend for a very short duration say one week. You just have to do a little bit of research in order to find out the best schools which will provide you with professional training in the shortest time possible. You will have to appear for the exam again only if you haven’t worked in any healthcare facility within the past two years. Some states allow you to appear for the CNA certification exam directly and some may require you to attend a training program before appearing for the exam. 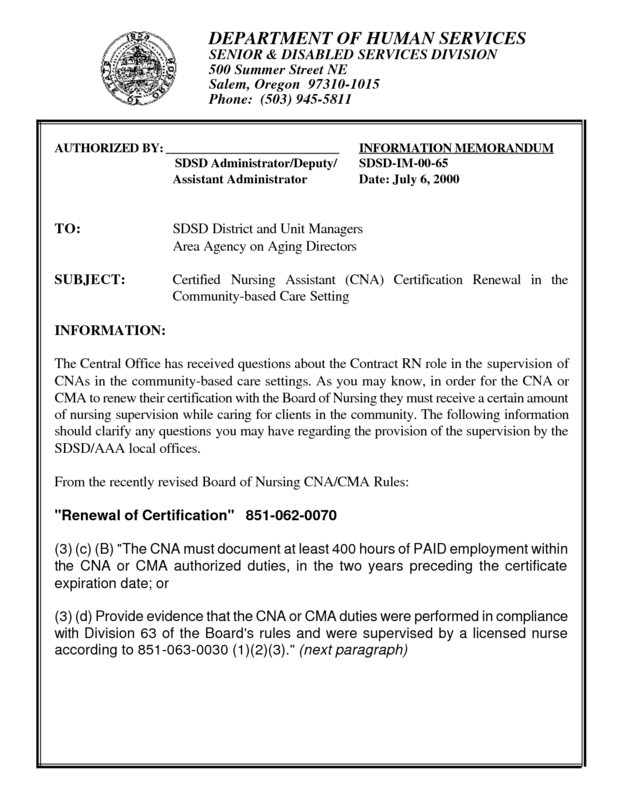 Every state has its own rules and regulations regarding the renewal of CNA certification. For example, the California state requires one to renew his or her CNA certification after every two years. You will have to submit the required paperwork to renew your certificate. If your California state CNA certification has expired before two years, you will have to undergo seventy five hours of training and then appear for the exam in order to get certified again. If the expiry has been within the past two years, you may very well apply for the renewal directly. It is better to know the rules and regulations regarding the renewal of your CNA License in your state before applying for the same. A certified nursing assistant has many opportunities to get lucrative jobs in the long term and middle term healthcare facilities like hospitals, nursing homes, mental wards and rehabilitation centers. A CNA can also work in a private home to take care of the ill or aged individual who needs daily care and help in eating, bathing, dressing etc. You will have to be dedicated to the job and execute the responsibilities well on a daily basis. There is a certain procedure to renew CNA License which allows you to get a job in a healthcare facility again as a certified nursing assistant. It gives you a chance to continue your career in the healthcare sector once again.